This item is a certificate from the Museum fur Volkerkunde (Anthropological and Ethnological Museum) in Leipzig, Germany. 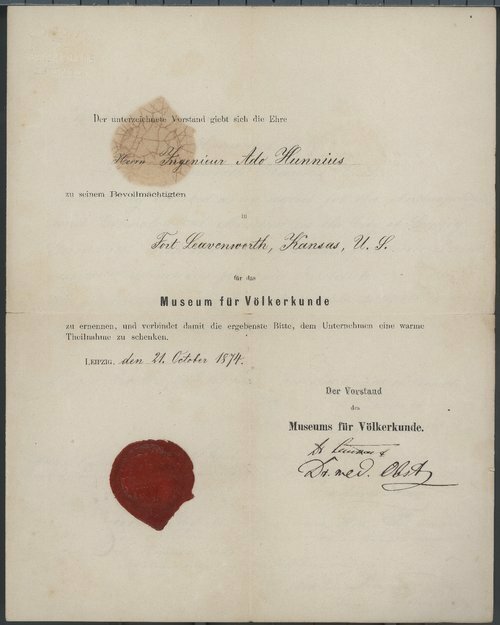 It was issued to Carl Julius Adolph "Ado" Hunnius by the Museum's executive committee on October 21, 1874, to certify that Hunnius would be "making collections and receiving donations for said institute" as their authorized agent. Shortly after receiving this certificate, Hunnius began gathering the data for his article "Die Indianer in der Vereinigten Staaten," which provides information on the Native American tribes in the United States of America.